Anyone who's had to completely format and reinstall software on a computer will understand my trepidation when I discovered my laptop was infected with a bunch of computer nasties. A format and reinstall was exactly what was suggested by an online tech site, primarily because I use my laptop to store sensitive data, do online banking, and ALL my business and personal information is resident on it. I've never done such a thing myself, and couldn't afford to be without my "life line" while I handed it over to someone else to accomplish. So, an incredibly helpful guy on www.techspot.com walked me through several stages of the cleaning process instead. Before even beginning, we found out how to freeze our credit reports and did so at all three credit reporting agencies. After that we set up email alerts on all the credit and debit card accounts which allowed us to do so. And then I rolled up my sleeves .. Took just about a week of downloading various programs for removing specific pieces of malware, spyware, adware, etc; cleaning, rebooting into Safe Mode, cleaning and scanning again; attaching a log on techspot's forum, going back and cleaning again .... and again and again. What a chore. And little to nothing else got done while I was carefully reading through directions, searching for things that didn't belong, attempting to rid my system of them and reporting back for the next round. The good news is that after all that, I'm now clean of infections and protected by several additional programs. I hope I don't have to go through all that again any time soon. Though I feel like I'm a lot better educated about dealing with something like this than I was before. I did bring up some beads and stringing materials and strung a few Bali n Bead pieces while things were scanning, or while I was waiting for my laptop to reboot. 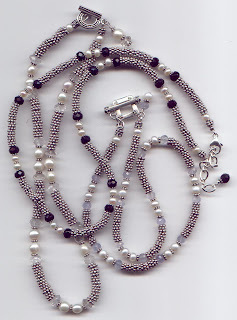 I love these necklaces - they have a nice heft to them and look good with both elegant and casual dress. I put two additional versions together that I haven't yet scanned .. a pretty dark blue iolite version and another using pale green quartz. I am now officially in need of more of those little granulated Bali spacers! !